Back to Taylors this week, and back to the medium side of their range. This is Cafe Imperial, a strength 3 blend that has been served in Betty’s Tea Rooms for over 40 years. The grounds have a surprisingly rich roast aroma, but still light with a fresh, tart citrus fruit undercurrent. Brewed, the richness is reduced and there’s more of a bitter tone – the citrus fruit also comes through more strongly. On tasting, it has a slight edge of bitterness without the strength of roast flavours that you might expect from a medium strength coffee – however, it definitely has a richer, fuller mouthfeel which is very pleasant. There are notes of light fruit in the flavour as well, not just in the aroma, and the finish is a little dry. 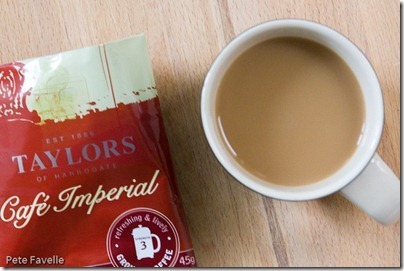 Overall, a nice coffee which has a good deal to offer given it’s strength – reflected in the fact that our work coffee club gave it one of the highest rankings for a strength 3 coffee from Taylors (and we liked our coffee strong). After several cups, I think this coffee deserves 3 stars.